Nintendo has revealed a silver 3DS XL adorned with the brothers Mario and Luigi. Nintendo keeps making more and more limited edition 3DS systems. 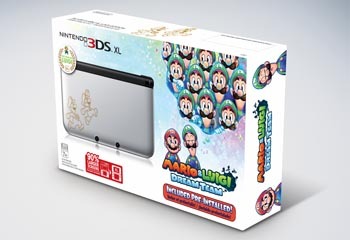 Available today, the next special 3DS is a silver 3DS XL featuring a running Luigi and jumping Mario. The system is bundled with pre-installed Mario & Luigi: Dream Team, which launched this past summer. The Dream Team 3DS XL joins the family of limited edition 3DS systems, including blue and red Pokemon X and Y 3DS XLs ($199.99), the gold Legend of Zelda: A Link Between Worlds 3DS XL ($219.99), and a Cobalt Blue 3DS with Luigi's Mansion: Dark Moon ($169.99). The silver Dream Team 3DS XL has a suggested retail price of $199.99, but you can find it at Best Buy for $179.99 today in the spirit of Cyber Monday deals. Players venture into Luigi's dreams to save Pi'illo Island in Mario & Luigi: Dream Team. Using the stylus and touch screen, players use Mario to interact with Luigi's dream world. Mario & Luigi: Dream Team is the fourth game in the Mario & Luigi series. The past two 3DS bundles have included pre-installed versions of Nintendo games that launched earlier in the year. With all of the attention on the PS4 and Xbox One, Nintendo should focus more on marketing strong, new games. The company also knows Mario and Luigi are Nintendo staples. Limited editions are one way to boost sales even if many people who buy them already have at least one of the many 3DS systems Nintendo has released this year.